The Arts Fund of Santa Barbara & The Santa Barbara Art Foundry & Gallery, have teamed up with Opera Santa Barbara to celebrate the debauchery of Falstaff, with a progressive feast, that promises to delight all the senses! The night begins at the Arts Fund of Santa Barbara, to explore their newest exhibit of “Obsession”. Hear from artist David Diamant, while enjoying delectable light bites from Chef Pink. Guests will then be escorted to The Santa Barbara Art Foundry & Gallery for a gluttonous three-course farm to table dinner & wine pairing. 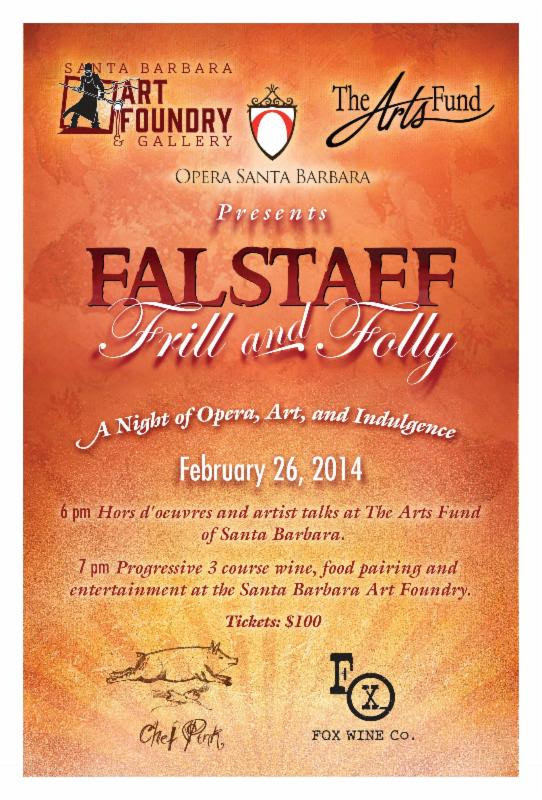 Singers from Opera Santa Barbara’s production of Falstaff will serve up entertainment in between courses. TICKETS TO THE EVENT ARE NOW ONLY $40!!!! ALL PROCEEDS BENEFIT THE ARTS FUND AND OPERA SANTA BARBARA. DON’T MISS THIS AWESOME OPPORTUNITY! !